With a total area of 3,396 square feet, the Fillmore provides ample space for a growing family. This ranch-style house plan has a finished floor area of 1,710 square feet once completed and features 3 bedrooms, 2 full baths, and plenty of optional designs. 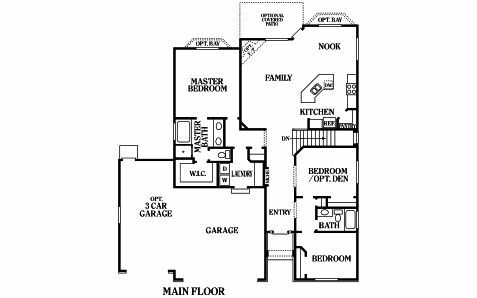 The master bedroom has a master bath with a tub and walk-in shower, as well as a walk-in closet. The 2 other bedrooms share the other full bath. The kitchen, nook, and family area are located in the great room at the end of the long entryway. The owners of the home have the option to install a bay window in the bedroom as well as in the family room. They can also add a cozy fireplace in the family area, as well as a covered patio at the back. One of the bedrooms can also be converted into a den or study if needed. Finally, the garage can be made to accommodate up to 3 cars. Take the headache out of designing and constructing your dream house by working with Perry Homes Utah. Our company has built heritage homes and developed family-friendly communities for over 40 years. Aside from offering thoughtfully designed and constructed homes at affordable prices, we also partner our clients with a design specialist who can walk them through all their customization options and answer all their questions about the home design or construction process. You can easily reach Perry Homes Utah for any concerns, even post-construction. Call us today at 801-264-8800 or use our Contact Us page to find out more about the Fillmore and the financing options we offer. Start building your dream home in Utah today with Perry Homes.